The two paragraphs that precede this unsubstantiated opinion as declared by the commission are in my view irrelevant because they relate to changes in public consent for matters of technological change that are easily reversible and have risk profiles that are minimal by comparison to a nuclear storage or transportation accident. Labor and Liberal politicians united earlier this year to profit from turning South Australia into a dumping ground for nuclear waste. But where do you put the most hazardous waste you can think of? Who’s backyard would our political leaders dump a hot radioactive mess in and feel guilt free about it? Who else but Indigenous Australians?. Fukushima was an unfortunate reminder of how badly nuclear can go wrong, and many countries have since reconsidered nuclear plans. Nuclear is unlikely to ever be the energy of the future it was once thought to be. So why think of poisoning any Australian land with nuclear waste at all? It’s a dream come true for some Australian politicians – rather than grapple with the politically difficult tasks of ending corporate welfare, or tax loopholes, or paying for essential services the Government could rake in a tidy $6 billion a year for at least 70 years. All they’d have to do is screw over an indigenous community. It’s practically business as usual. And when Labor and Liberal come together to make something happen, they sure can be brazen about their disregard for indigenous people. Wallerberdina Station near the Flinders Ranges is the only shortlisted site for the nuclear waste dump. Back in November last year, the indigenous community nearby demanded the government reject the proposal. The dump threatens a local heritage site. Federal Resources Minister Josh Frydenberg has creatively interpreted their concerns as “a broad level of community support“. Frydenberg has said that consultation with traditional owners would be undertaken as part of the next phase of the project. That seems nice of him, except that the number of proposed sites for the dump is: 1. Just that site. What do you think the likelihood is the consultation will result in the only site planned being scrapped? The ‘pie in the sky’ financials of the South Australian Nuclear Royal Commission’s Report. CLIMATE Most Australian prioritise Great Barrier Reef over coal industry. Australian Greens set out plan for a solar South Australia. NUCLEAR Our national survey of Labor politicians and election candidates: email and phone responses are dribbling in. Indications are that Labor politicians are in general very much opposed to any change in Labor’s anti nuclear policy, and especially to importing radioactive trash. Greens propose a more rational way to deal with Lucas Heights’ returning nuclear wastes. Labor would reinstate funding to environment legal centres. Renewable energy. Solar change brings economic, social benefits to remote indigenous community Renewables Could Boost Australian Employment by 50% – NFP Report. Batteries an energy game changer. Victoria’s Premier Daniel Andrews has ambitious plan for boosting wind energy. Melbourne’s world first renewable energy project. Ever-growing boom in rooftop solar energy in New South Wales. There are a number of sessions in which 10 randomly selected South Australians will be able to sit in and watch proceedings, hear what the Jury hears and observe how democracy works in this important discussion. While sessions will be broadcast publicly via media organisations and live streaming on the YourSAy website, at any time the jury reserves the right to deliberate privately and can ask for the jury room to be cleared. Registration for the first two days of the Citizens’ Jury (Saturday 25 June and Sunday 26 June) will close at 5pm Wednesday 22 June, 2016. Registrations for the last two days (Saturday 9 July and Sunday 10 July) will close at 5pm on Wednesday 6th July. All applicants’ names will be sorted into a random stratification process which will be facilitated independently by newDemocracy Foundation. To allocate seats, a random number draw will be conducted. Successfully drawn applicants for the first weekend of the Citizens’ Jury will be notified by telephone or email on Thursday 23 June. Successfully drawn applicants for the second weekend will be notified by telephone on Thursday 7 July. At this well attended forum last week, people heard from Professor Ian Lowe who posed the question “Why are we even considering this rather daft idea of setting up as the radioactive waste capital of the world?”. Reminding us that a decision to establish a radioactive waste dump is a permanent decision and an unreasonable burden on all future generations, Ian concluded by saying “I urge you to position South Australia as the clean energy power house for Australia rather than the radioactive waste dump for the world”. Adnyamathanha Traditional Owner and Greens Candidate for Grey, Dr Jillian Marsh talked about the impact the nuclear industry has had and continues to have on Aboriginal people and said “We’re not satisfied with the way our Governments are behaving. We’re not satisfied that they’re acting in our national interest. It’s time they started doing that”. Highlighting how the Royal Commission’s Findings don’t stack up economically, The Australia Institute Economist Rod Campbell told us “I don’t know that much about nuclear engineering or South Australia’s geology. I’m an economist and I do know dodgy economic modelling when I see it”. And lastly, Greens Senator for South Australia, Robert Simms, reminded us that the Greens are the only Party standing up with the community to stop South Australia from becoming the world’s radioactive waste dump. Xenophon “can’t see benefits” of nuke dump, InDaily, Tom Richardson, 17 June 16 Influential senator Nick Xenophon has come down against the establishment of an international nuclear repository in South Australia, arguing “I can’t see the benefits are there that outweigh the risks”. It comes as the state’s chamber of commerce, Business SA, nailed its own colours firmly to the mast, with chief Nigel McBride saying the organisation was now “advocating actively and positively for a high-level waste repository here in SA”. InDaily revealed in March that McBride would be joining a business delegation organised by the Committee for Adelaide to tour nuclear sites in Europe, but at the time he insisted he was there to observe and learn, not to advocate…… with a public information campaign gearing up in the wake of the Scarce Royal Commission’s bullish final report, McBride says he is now prepared to take a lead in pushing for the repository to become a reality. He said “thought leaders” in the community, rather than politicians, should step up to play a prominent role in the debate. “We’re absolute advocates,” he said of Business SA……. But the influential lobby group’s enthusiasm was not reciprocated by Xenophon at an election forum, co-hosted last night by a range of interest groups including the Wilderness Society and Conservation SA in the marginal electorate of Hindmarsh. In a packed Glenelg Football clubroom, Karina Lester from the Yankunytjatjara Native Title Aboriginal Corporation pressed Xenophon on where his fledgling party stood on high-level nuclear waste imports. “Would your party listen to us and support the overwhelming majority of traditional owners who continue to speak out against establishing an international nuclear waste dump?” Lester asked. He has previously endorsed a referendum on the issue, explaining last night that “it seems to me you might get a consensus between the two major parties here in SA and it might be seen as a a done deal [so] it’s important to get the consent of the community”. However, he added, “if a referendum were held tomorrow I can’t see myself supporting it”. “I can’t see the benefits are there that outweigh the risks,” he said. Australian Greens announce plan to fund solar panels for 48,000 SA homes June 16, 2016 http://www.adelaidenow.com.au/news/national/federal-election/australian-greens-announce-plan-to-fund-solar-panels-for-48000-sa-homes/news-story/fd62f39d9131861e539f9a674 Political Editor Tory Shepherd, Advertiser MORE than 48,000 South Australian homes would get solar panels and energy efficient measures under an Australian Greens plan to reduce electricity costs and reduce emissions. Deputy Leader Larissa Waters and SA Senator Robert Simms has announced in Adelaide today a plan to spend $2000 on each public and community housing home, which they say could save renters as much as $1075 a year. The plan would cost $60 million a year, and would not be finished until 2030. By that point homes would be retrofitted with energy-saving and water efficient devices, with solar on every roof. Senator Simms said it would also boost jobs, employing thousands of South Australians. “This initiative would not only provide South Australians with more jobs in the renewable energy and green housing sector, but it would save the average household $780 per year in electricity bills from installing solar alone,” he said. Senator Waters said nationally it would help about 800,000 people. More than 2400 deaths a year are associated with cold weather, she said. “We have an unequal system where our lowest earners are paying the highest price for power, many in ageing houses that are inefficient to run, hot in summer and freezing in winter,” she said. The Greens will not be able to form Government but they may share the balance of power in the Senate after the July 2 election, which could give them leverage over the major parties. Wind farm boom looms as Premier Daniel Andrews looks to boost clean power, The Age, Adam Morton, 16 June 16, Senior Writer Victoria would have 40 per cent clean electricity in less than a decade – nearly tripling the current level – under an ambitious plan announced by the Andrews government. The government has set targets to ramp up wind power and large-scale solar power, paid for through an increase in household and business electricity bills and spending from the budget. With private spending on clean electricity largely stalled due to a lack of confidence in federal government support for a national renewable energy target, the Andrews government believes its policy will make Victoria the centre of a revitalised industry. It estimates that, at the peak of construction in the middle of the next decade, there will be about 4000 workers helping to build the target’s 5400 megawatts capacity of clean energy. To put that in perspective, there are 18 wind farms with planning approval in the state, but not built. The government says its target will improve the viability of the industry enough to build all of them – and nearly as many again – within nine years. On top of this, one-fifth of the new generation capacity built would be solar plants in the state’s north. In a statement, Premier Daniel Andrews said meeting the targets – 25 per cent by 2020 and 40 per cent by 2025, up from 14 per cent today – would bring about $2.5 billion of clean energy investment into the state. South Korea looks to build used fuel store http://www.neimagazine.com/news/newssouth-korea-looks-to-build-used-fuel-store-4907688 30 May 2016 South Korea will select a site for an underground storage facility to permanently dispose used nuclear fuel, or high-level radioactive waste, by 2028 and complete the construction of the facility by 2053, according to the first roadmap for the project released by the Ministry of Trade, Industry and Energy on 25 May. “A further delay in building the facility will put a drag on future generations, considering the saturation level of interim storage units located in the nuclear power complexes nationwide, ” Chae Hee-bong, the ministry’s energy policy director, told a press briefing. Korea has 24 nuclear power units which produce more than 700t of used nuclear fuel annually. According to ministry data, the first used fuel storage unit to become full will be at the Wolsong NPP in Gyeongju, North Gyeongsang Province, in 2019. Korea has no other choice than storage as it is strictly banned from reprocessing under a 1973 treaty with the USA. The government has been trying to find a site for the wastes since 1983, but has failed nine times because of local protests. The government said the country is running out of storage units. To minimize public resistance in the course of a site selection, the ministry will adopt an open competition among geologically qualified sites. It will launch an independent committee to lead the site selection next year, following an approval by the National Assembly on the roadmap in the latter part of this year. The roadmap will be updated in five years embracing changing external conditions, the ministry added. The ministry’s ‘road map’ is based on recommendations from the Public Engagement Commission, an independent advisory group set up in 2013. The ministry will hold a public hearing next month, followed by an inter-agency meeting chaired by the prime minister in July. Park Dong-il, director of the nuclear power environment division at the ministry said: “It will take about 12 years to select the location and we will hear what they want to receive from the government and make deals during this period,” said. He added that the government will decide what kind of benefits or incentives to give to areas that want to build storage facilities. According to the ministry, it will take the government about eight years to select the site and get feedback from local residents, and another four years to investigate the geological chracteristics of the site. The project was expected to cost some KRW53,000bn ($44.8bn) in 2013 but a government official said it is now looking at an estimated cost of KRW63,000bn. Meanwhile, the Korean government opened its first low-and intermediate-level radioactive waste facility in Gyeongju, North Gyeongsang, last year. The government wanted to build a high-level facility there but faced opposition from residents. Almost one-quarter of households in WA’s biggest power grid have rooftop solar panels, according to a report that predicts production from the systems will more than double within 10 years. In its first snapshot of the South West electricity market since getting responsibility for it last year, the Australian Energy Market Operator will today report that the number of solar panels had trebled in six years. AEMO said there were 180,000 customers with solar panels across the network from Kalbarri to Kalgoorlie and south to Albany, compared with 165,000 a year ago and just 60,000 in 2011. Though the latest figure represents more than 18 per cent of State-owned power provider Synergy’s entire customer base, the percentage of households with solar cells is even bigger. AEMO says 22.5 per cent of South West network households have a system, making WA third for solar panels behind Queensland and South Australia. The Melbourne-based body also found households and businesses were using bigger systems with the average size of new installations doubling over five years to 4.5kW. AEMO said the growth rate in solar panel installations in WA was unlikely to slow as prices fell, electricity tariffs rose and subsidies continued. It said the amount of electricity solar panels generated would almost treble between 2016-17 and 2025-26. 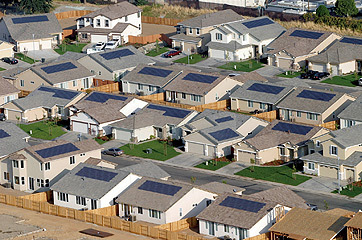 One consequence would be flatter demand from the grid as more people generated electricity. With battery storage developing rapidly, the shift from grid power could accelerate with cost implications for customers unable or unwilling to use solar. AGL CEO Andrew Vesey, on the future of energy why batteries are the way to go.